And it is in that committed comic-book aficionado spirit that "From Superman to the Rabbi's Cat" presents some 230 American and European works dating back to 1890, including the 1940 strip How Superman Would End the War. "I'd like to land a strictly non-Aryan sock on your jaw," grumbles the Man of Steel as he drags Adolf Hitler off to be tried for crimes against humanity. For the late comic-book artist Will Eisner, the Jewish people, faced with the rise of fascism, "needed a hero who could protect us against an almost invincible force." Jerry Siegel and Joe Shuster's Superman in 1938 was only the first and - like Bob Kane's Batman in 1939, Jack Kirby's Captain America in 1940 and many more that followed - he was created by sons of Jewish immigrants living in New York. Like their characters, many of these artists took on dual identities, says author and comic book historian Didier Pasamonik, a consultant on the exhibit: "There was a kind of diffused anti-Semitism at the time, and it was better to use a good American commercial name to reach the wider public." Even as Robert Kahn had become Bob Kane and Jacob Kurtzberg worked as Jack Kirby, their superheroes reflected some of the identity they were masking, evoking Jewish concepts such as tikkun olam (repairing the world through social action) and legends such as the Golem of Prague, the medieval superhero of Jewish folklore who was conjured from clay by a rabbi to defend his community when it was under threat. Years later, some comic superheroes would actually be identified as Jews, like Auschwitz survivor Magneto and - the Golem myth incarnate - Ben Grimm (The Thing) of the Fantastic Four. But despite the rumors, the Man of Steel is no Supermensch, says Pasamonik. 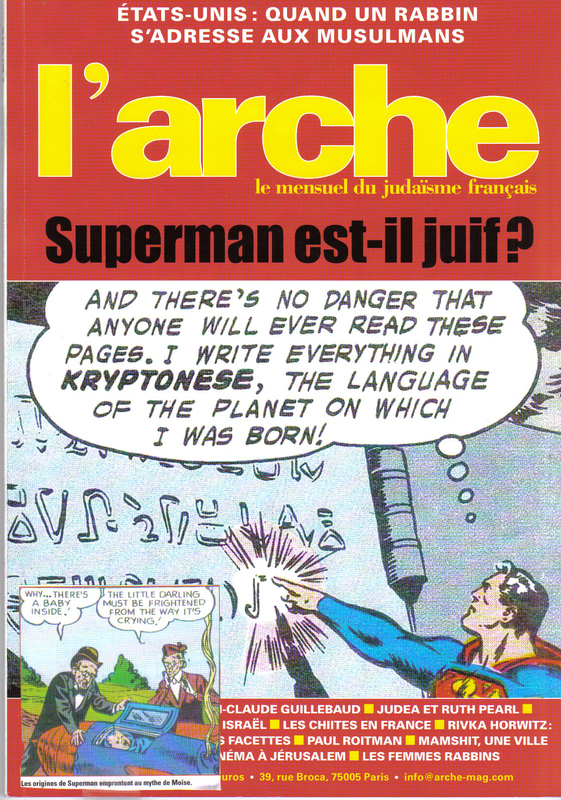 "Superman is not Jewish," he says. "When Superman gets married it's not at the synagogue!" 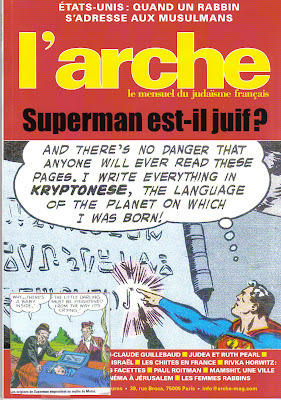 Pasamonik has not missed the heavy dose of Jewish culture Siegel and Shuster instilled in their character: baby Superman's passage through space in a cradle-like vessel and subsequent adoption "is the story of Moses," he says, adding that El of Superman's given name Kal-El is a Hebrew word for God. But with a Methodist upbringing and extra-terrestrial origins, Superman, says Pasamonik, is best described simply as a "non-Aryan" hero. And why not? 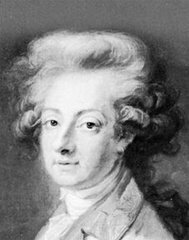 Non-Aryan describes most of the southern and eastern European and Asian immigrants that crossed the oceans with the Siegels, Shusters, Kahns and Kurtzbergs in the late 19th and early 20th century. For the Pulitzer-prize- winning cartoonist Jules Feiffer, World War II-era superheroes embodied the American dream shared by the countless foreigners. "It wasn't Krypton that Superman came from; it was the planet Minsk or Lodz or Vilna or Warsaw," wrote Feiffer in his essay The Minsk Theory of Krypton. "Superman was the ultimate assimilationist fantasy." After World War II, the comic book genre became an unlikely vehicle for civic protest and consolidation of memory. "The hour of immigrant assimilation gave way to the fight for minorities and civil rights," explains Pasamonik. Harvey Kurtzman used the medium to tackle racial segregation, the Cold War and McCarthyism in his satirical MAD magazine. In 1955, when popular awareness of the Holocaust was scant, Bernard Krigstein and Al Feldstein caused a shock by revisiting the concentration camps with the seminal graphic story Master Race. During the '60s and '70s the genre opened up to the banal and biographical, with Pekar and Crumb's darkly humorous American Splendor and Eisner's landmark graphic novel, A Contract with God. "Eisner brought an absolutely revolutionary dimension to the graphic novel, which was to make it an instrument of memory," says Pasamonik. Finally, with a nod toward Edmond-François Calvo's 1944 La Bête est Morte (The Beast is Dead) - which uses animals to tell the story of World War II - Art Spiegelman brought the graphic novel worldwide recognition by winning a Pulitzer prize in 1992 for his Holocaust saga, Maus. Eisner and Spiegelman's heirs now litter the globe, from Frenchman Joann Sfar (The Rabbi's Cat) to Iranian Marjane Satrapi (Persepolis). "From Superman to the Rabbi's Cat" pays homage to these artists, inviting the viewer to consider the subtexts at work even in comic books about men in tights."